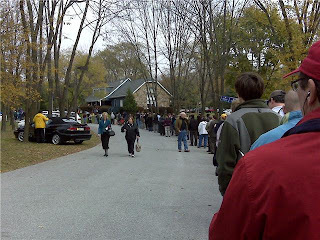 This is a picture from East Caln Township polling center. Chic Fil A is passing out snacks and there is a playground for the kids. I have been waiting in line for 30 minutes. I have seen lots of my neighbors coming out and the average wait seems to be 2 hours. Oh wow! I voted in West Bradford Township and stood in line with my two year old for almost two hours. There were no drinks or snacks being given out. No playground either although the kids enjoyed climbing a little tree in that was in the center of a grassy area and playing in the leaves.